Blacktown Mount Druitt Hospital (Blacktown Campus) added Carer Zones to 40 single rooms in its new Clinical Services Building, so carers can stay at the hospital overnight in comfort. To improve the experience of carers who stay overnight at Blacktown Mount Druitt Hospital (Blacktown Campus). Improves the hospital experience of patients, families and carers. Engages consumers and carers in the development of healthcare facilities. Empowers consumers with the ability to create meaningful change through their involvement in hospital decision making. Supports NSW State Health Plan: Towards 2021 (Providing World Class Clinical Care by Listening to Patients). Aligns with NSW Health’s responsibilities under the Carer Recognition Act 2010 to consult with carers, or organisations that represent carers, on policy that may affect them. As part of the Blacktown Mount Druitt Hospital Expansion Project (Stage 1), extensive consumer consultation was undertaken. It identified that many patients wanted a family member or carer to stay with them overnight while they were in hospital. This was particularly important for culturally and linguistically diverse and confused patients, who need help articulating their needs. Feedback showed that having a familiar person with them made them feel less anxious, while staff found the support of a person staying overnight improved patient experience and communication. At the time, hospital rooms did not accommodate family members or carers, who often slept in a chair if they stayed overnight. There were also restricted visiting hours for families and carers, as well as difficulties with access to hospital facilities such as parking. The redevelopment of the hospital provided a valuable opportunity to address these concerns. A co-design process was undertaken in collaboration with consumers, to develop Carer Zones in 40 single rooms across the new facility. They are the first of their kind in NSW , featuring a defined space for the carer to sleep within the patient’s room, with direct access to bathroom facilities. This allows the carer to stay overnight in comfort, while retaining their privacy and not impeding the observation and care of the patient. During the day, this space acts as a sitting room for the patient and their carer. ongoing feedback and evaluation mechanisms (formal and informal) for staff, patients and carers, to ensure ongoing improvement of the program. Each element of the program was designed, planned, implemented and evaluated in collaboration with patients, carers and consumers, as well as a broad range of clinical and non-clinical staff. Since the opening of the new Clinical Services Building at Blacktown Mount Druitt Hospital (Blacktown Campus) in April 2016, there has been significant use of the Carer Zone facilities. Qualitative feedback sourced in May 2016 was extremely positive, with patients who had carers staying overnight reporting reduced anxiety and improved satisfaction with their healthcare experience. 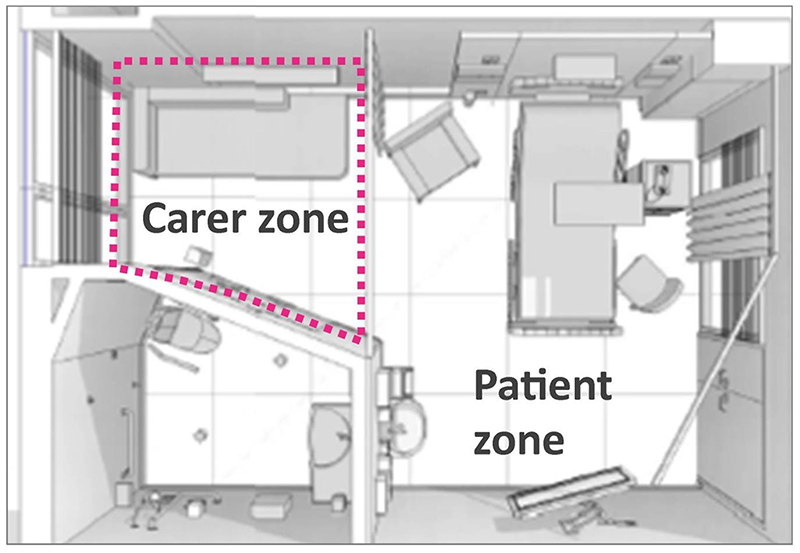 The average length of stay for patients using Carer Zones is 6.5 days. support in personal care activities. led to better communication between staff, carers and patients (94%). There was also a 600% increase in the use of carer education resources in the Aged Care Ward over this time. 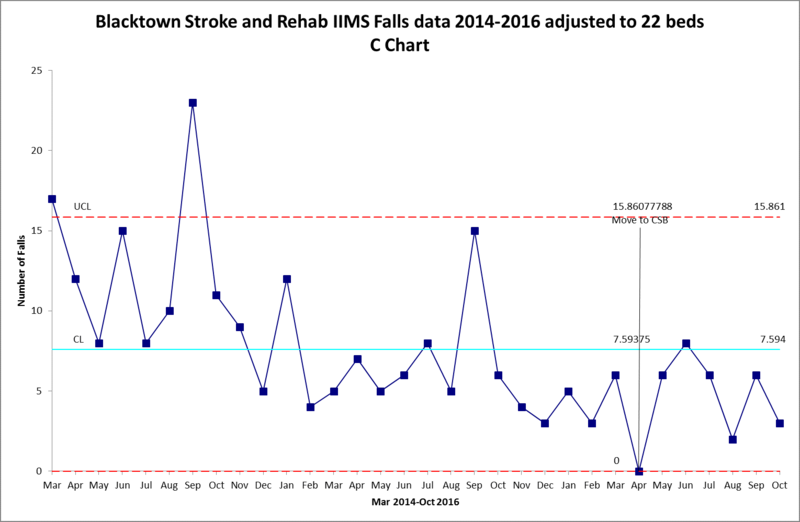 Incident Information Management System (IIMS) data collected from March 2015 to October 2016 showed a 40% reduction in falls over a 24-hour period in the Stroke and Rehabilitation Ward since implementation of the Carer Zones. Staff cite having a carer stay overnight, the ‘see and be seen’ design of the ward areas and Falls Huddles as the main contributors to this decrease. The data showed a 68% reduction in falls between midnight and 8am in the first six months of Carer Zones. Representatives from dozens of organisations across Australia have visited Blacktown Mount Druitt Hospital (Blacktown Campus) to view the innovative design, with a number due to replicate the initiative. However, the initiative does not rely entirely on purpose-built Carer Zones. Many of the cultural and operational elements can be readily adopted into hospitals across NSW . The project is a genuine example of co-design, where ongoing consultation is undertaken with staff, patients, carers and consumers. However, to ensure the consultation process leads to meaningful change, it is important to include these stakeholders in the multidisciplinary project team and involve them in decision making. All members of the project team should have a shared vision for the project and a willingness to adapt in response to feedback from patients, consumers and the community.